Sometime in the next 10 days, the president will name his choice for chair of the Federal Reserve. Yesterday he told reporters he is “very, very close.” His aides have said he’ll make a decision before he leaves on a trip to Asia Nov. 3. We’re not going to bother handicapping the race here. You can read that stuff anywhere. Just know that our macro maven Jim Rickards still says the pick will be financier and former Fed governor Kevin Warsh — who by now is a dark horse in the estimation of conventional wisdom. If Donald Trump doesn’t make the right choice for Fed chairman, he risks becoming the first one-term president in a generation. That’s how high the stakes are. Let’s take a short trip through the history of every president who’s been elected since 1980. Reagan: Entered office six months after the end of one recession and six months before the start of the next. Maybe you already see where we’re going with this. Trump and Poppy Bush are the only presidents of the last 35 years who came into office inheriting a years-long economic expansion. Everyone else was either in a recession, going into a recession or coming out of a recession. Bush the Elder had the misfortune of a recession starting about 18 months after he took office. It was over in nine months — March 1991, according to the wonks who come up with recession dates at the National Bureau of Economic Research. But by November 1992, the public perception was that the economy was still punk — enough that voters sent Poppy packing. He’s the only one-term president Americans younger than 40 can remember. Whether or not Trump is aware of this history, he runs the risk of repeating it. In July 1991, shortly after the end of that 1990–91 recession, Poppy faced the same decision Trump faces now. But an Associated Press account at the time hinted at tension: “Over the past year, as the economy sunk into its first recession in eight years, Bush and his senior advisers have constantly pressured Greenspan and his fellow board members to stimulate an economic recovery by quickly and steeply lowering interest rates. In October 1990 — shortly after Saddam Hussein invaded Kuwait and gasoline prices jumped — the Greenspan Fed began lowering the fed funds rate. From 8%, the rate came down steadily to 3% by Election Day 1992. But for many of Bush 41’s advisers — especially Treasury Secretary Nicholas Brady — it wasn’t fast enough. 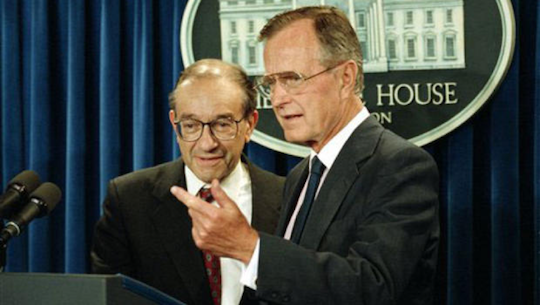 In 1998, Bush himself laid blame for his election loss at the feet of Alan Greenspan. For Trump the stakes are even higher because the Fed is in the midst of a rate-raising cycle. But as Jim Rickards has been telling us time and again… raising the rate might well choke off the “expansion,” such as it is, and trigger the next recession. Which brings us back to Jim’s dark-horse pick for Fed chairman. Who would be most appropriate choice for the “disrupter in chief”? “If you are looking for something disruptive, put Kevin Warsh at the top of the Fed,” Art Hogan tells the BBC. Hogan is chief market strategist at Wunderlich Securities. The knock on Warsh, and the reason conventional wisdom is down on him, is that he doesn’t have an academic background. But Jim Rickards says that’s a plus: “He’s a lawyer, not an economist. He works for a hedge fund, not a university economics department. Then again, Fed chairmen don’t always follow the script the president hopes they will. The last one-term president could tell Trump a thing or two about that, huh? To the markets, where the Dow is soaring to new highs on the strength of earnings from Caterpillar and 3M. At last check the Big Board is up three-quarters of a percent. It’s now 55 points away from the 23,500 mark. Not that everything is hunky-dory among industrial giants: General Electric is down about 1%, on top of yesterday’s 6.3% loss. GE’s numbers disappointed last Friday, enough that its 4% dividend might be at risk. Year to date, GE is down 20%. Does that make it a bargain? “If you’re looking to scoop up cheap GE shares, your best bet is to wait for one of my favorite Dow trading ‘signals,’” says colleague Greg Guenthner. There’s history on Greg’s side here — Alcoa, which lost its lofty status as one of the Dow 30 stocks in 2013. “The aluminum company had enjoyed 54 years as a member of the Dow Jones industrial average. But Alcoa’s low share price had become a bit of a problem for the Dow (which, unlike the S&P 500, is a price-weighted index). That means that toward the end of its run, even a major move in Alcoa shares barely registered on the Dow. In that sense, the company had become irrelevant. Hmmm… GE is the only company that’s been part of the Dow for the index’s entire 121-year existence. But tradition won’t matter in the face of a share price spiraling downward. Too, in the 21st century, the Dow has never gone longer than about three years without a makeover. And the last one came in March 2015. GE might be a buy sometime next year. Venezuela is in such rough shape that it can’t even take back the gold it pawned a while back. If you’re a really longtime reader, you’ll recall the country’s late caudillo Hugo Chavez repatriated Venezuela’s 160-metric ton gold stash — held overseas with the Bank of England, JPMorgan Chase, the Bank of Nova Scotia and other institutions. 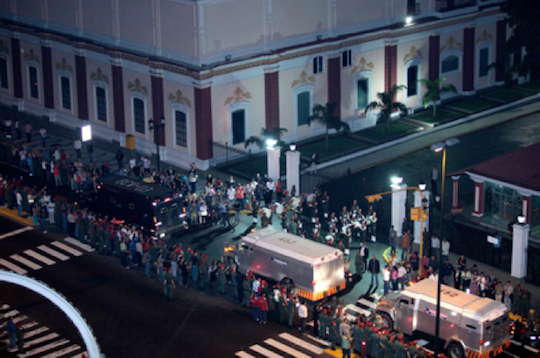 Crowds greeted motorcades of armored vehicles on the streets of Caracas in November 2011. But six more years of socialist misrule (and three years of low oil prices) have put Venezuela in a bind. Per the Troubled Currencies Project at the Cato Institute, inflation is running north of 2,500% a year. The government put up $1.7 billion of gold as a guarantee in exchange for $1.2 billion cash. It will collect the $500 million difference in cash. But hey, everyday Venezuelans can try to get rich on bitcoin. “Bitcoin mining is part of a growing, underground effort in Venezuela to escape the worst effects of a crippling economic and political crisis and runaway inflation,” reports the AFP newswire. Who says socialism doesn’t work? “Die early to save Social Security?” a reader writes after yesterday’s episode. “Zeke ‘Please Die Early’ Emanuel must be clicking his ghoulish heels over this! “Your item pointing out that Americans are dying sooner and the late-50s group having more serious health issues than just five–10 years ago forgot to point something out. This morning, Lou recommended Extreme Alpha readers close out his Caterpillar call option recommendation today for 300% gains. Yes, there’s more where that came from. In fact, Lou anticipates even better opportunities with tax reform on the horizon. Check out the latest right here.